I would love to tell you about our big baby! 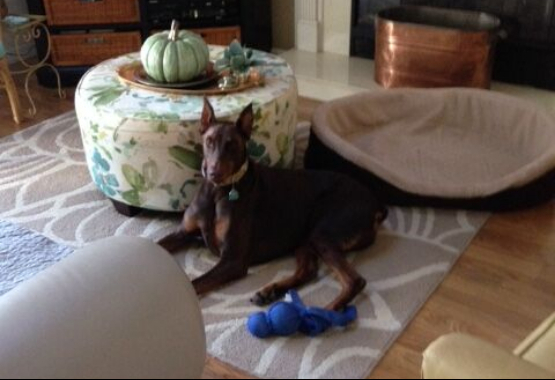 Her name is Lela and she is an 80 lb female Doberman. We rescued her two years ago from an absolutely phenomenal organization called Dobie Ranch Rescue in Crystal River, FL. Lela was her given name so we did not change it. She was from St. Augustine, FL and fostered in Jacksonville; we picked her up in Jacksonville on November 20, 2015. We think she was 3 when we adopted her so is around 5 now. Lela is by our side wherever we go! She loves everyone, including our grandchildren. The only things she does not love are storms and our garage - she won't go near it. If we want to take her in the car, we have to pull the car out of the garage and she gets in it in the driveway! As Dobermans are naturally predisposed to guard, if she misses you for a minute, she is instantly coming to check on you. When she finds you she will sit and guard you! She is extremely smart and knows when she has been naughty - like not coming in when called. She thinks it's funny to take your shoes or bath towel outside! She doesn't chew them up, just moves them. A few weeks after we brought her home she grabbed one of my tennis socks. I told her to drop it, to no avail and of course, chased her around to retrieve it. She sat down, looked at me and swallowed it!! After 2 days and no sock "delivered", we took her to the vet who xrayed her. The vet told us we had 3 more days to see if she'd get rid of it, or they would have to operate. On day 3 she threw it up!